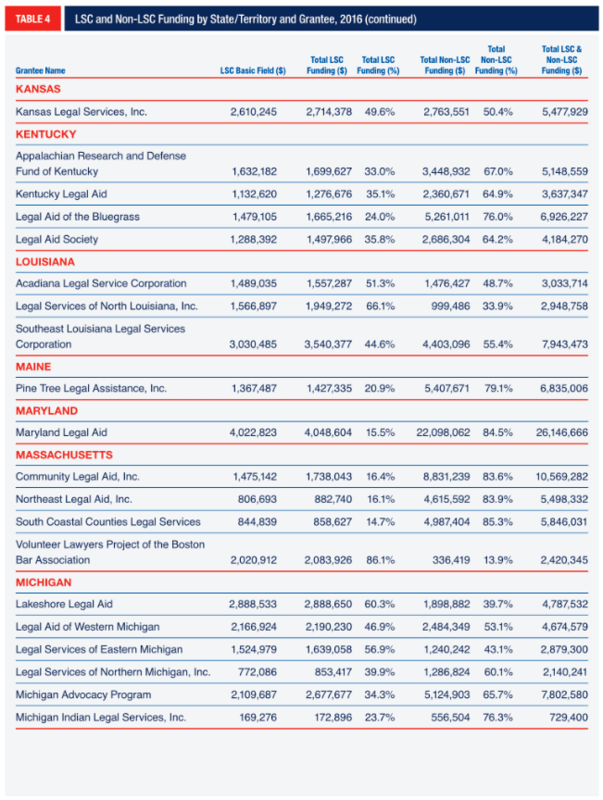 I am pleased to present the 2016 edition of LSC by the Numbers: The Data Underlying Legal Aid Programs — formerly known as LSC’s Fact Book. Understanding data is critical to the work of the Legal Services Corporation. LSC by the Numberspresents national data on 2016 LSC program activity. The goal is to provide a national perspective on and overview of LSC-funded grantees’ work on behalf of low-income people seeking civil legal assistance. The report includes data on the services provided by LSC’s 134 grantees in 2016, client demographics, program staffing, expenses, and private attorney involvement (PAI). We have included trend data to show changes over time. LSC-funded organizations may serve an entire state, a region within a state, or a single city or county. Many grantees maintain multiple offices, while others operate only one. Some grantees operate part-time satellite offices and run hotlines that provide telephone intake, advice, and referral programs to facilitate access to their services over a large geographical area. LSC by the Numbersreflects actual data from calendar year 2016, unless otherwise noted, with no extrapolations or estimates. The majority of the data are derived from the Grant Activity Reports that LSC grantees are required to submit each year, reporting activity in the previous calendar year. The remainder is collected from LSC grantee financial and funding records. LSC’s Strategic Plan calls for enhanced data collection, analysis, and reports to achieve the goal of maximizing the effectiveness and quality of civil legal services. To that end, LSC established an Office of Data Governance and Analysis in 2015. This office collects and analyzes data used by other funders, courts, academics, and researchers looking for reliable and comprehensive information on legal services for low-income populations. This publication is a product of their efforts to track, analyze, and report this data. We are continually seeking to improve LSC by the Numbers. Our aim is to make it a readily accessible resource for a wide audience. We are interested in your comments and suggestions for other data compilations that would be useful. This report provides a summary of data regarding service delivery by the Legal Services Corporation’s (LSC) 134 grantees in Calendar year 2016. The information is drawn from year-end Grantee Activity Reports, which are required of all Basic Field grant recipients. 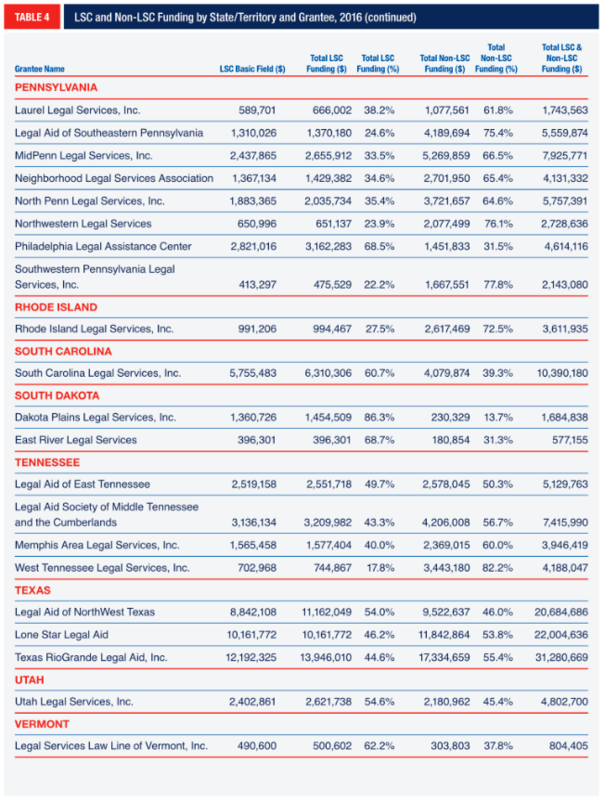 As with past reports, the 2016 LSC by the Numbers provides details of grantee revenue and expenditures, client demographics and services, staffing statistics, and information about private attorney involvement in legal services. The presentation of data has changed from previous years to improve readability and to highlight changes from prior years or variations below the national level. The information presented in this report summarizes data from the three types of service areas that make up Basic Field Grants: Basic Field – General, Basic Field – Agricultural Worker, and Basic Field – Native American. Given the difference in size across the three service areas grants, it is sometimes necessary to disaggregate the data in order to identify trends in funding or services. The substantive sections in this report follow the same basic structure as in past years. We begin with national data to provide a general overview, and use detailed break-outs of the data to examine systematic differences over time, by service area type or across the states. We provide more detailed tables in appendices to report information at the state-level and for individual grantees. In 2016, LSC’s congressional appropriation was $385 million. LSC provided $383 million to grantees in 2016, which constituted 36.8% of the total funding LSC grantees received. Since 2011, LSC funds (including funds carried over from the prior year) have comprised a decreasing proportion of LSC grantees’ total revenue (Section 4). 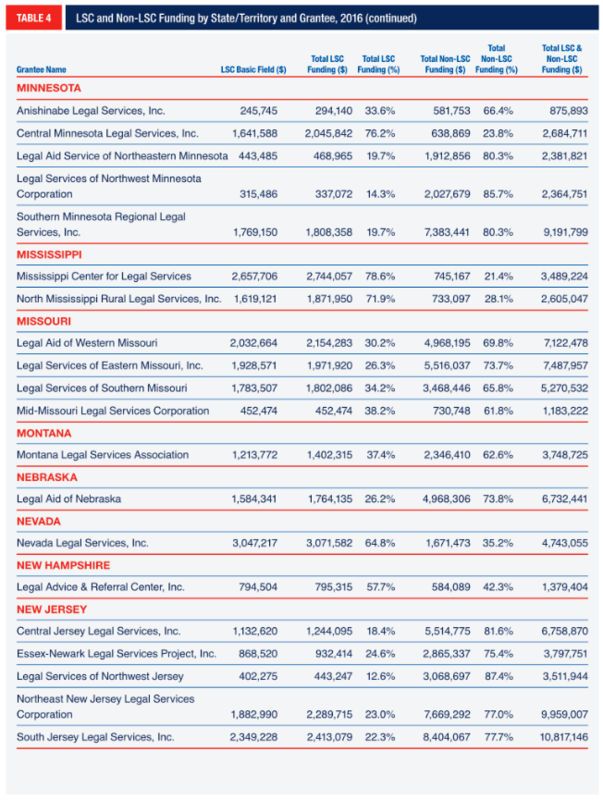 LSC grantees spent more than $900 million delivering legal aid services in 2016, more than three-quarters (77.6%) of which went to paying staff salaries and benefits (Section 5). In 2016, LSC grantees closed over 736,000 cases, including more than 235,000 Family cases and more than 200,000 Housing cases. In addition, LSC grantees helped more than a million people with services like legal clinics, legal education workshops, self-help materials, and referrals. More than 18 million unique users accessed LSC grantees’ websites (Section 6). Private attorneys, law students and graduates, and paralegals and other legal professionals were involved in closing more than 87,000 cases in 2016. Almost half (47.0%) of these cases were Family cases, such as divorce, custody, or adoption cases (Section 7). About 1.8 million people were served by LSC grantees in 2016, including more than 736,000 named clients. Over 500,000 (71.6%) clients were women and more than 130,000 were 60 years of age or older (Section 8). LSC grantees maintained 820 offices and employed almost 9,300 full-time equivalent staff in 2016 (Section 9). Basic Field Grants, LSC’s largest funding program by far, comprised 91.5% of LSC funding to grantees in 2016. These grants provide funding to support access to justice for low-income people throughout the U.S. and its territories through the delivery of high-quality civil legal services. LSC grantees provide assistance for a wide variety of basic civil legal needs of the poor, addressing matters involving safety, subsistence, and family stability. The majority of cases handled by LSC grantees focus on family law, such as domestic violence, child support, and custody, and housing matters, including evictions and foreclosures. Basic Field Grants are awarded on a three-year cycle through a competitive bidding process, and grants must be renewed and generally approved every year.2 Applications are accepted for specified service areas in the United States, the U.S. territories (American Samoa, Guam, Puerto Rico, Northern Mariana Islands, and the U.S. Virgin Islands) and the independent states of the Marshall Islands, Micronesia, and Palau. Basic Field – General:Grants in these service areas are intended to provide legal services to the general low-income population living in a specific geographical area. Throughout this document, these service areas are called “Basic Field – General” or “General” service areas. 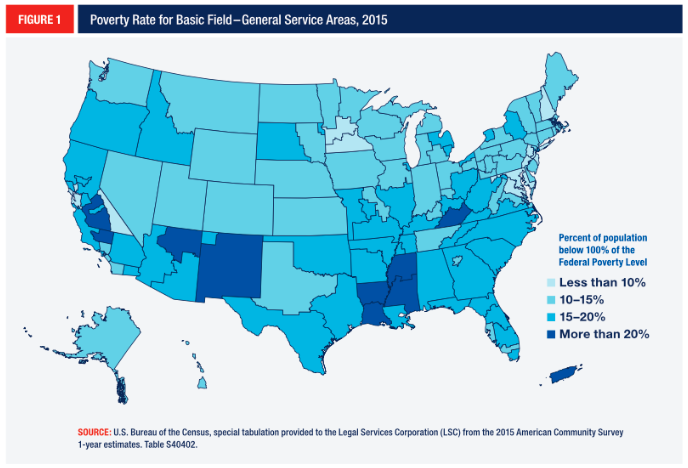 These service areas identify a specific geographic boundary in which Basic Field grantees are responsible for providing high-quality legal services to the eligible population. These service areas may consist of several counties and cities in a state; they may encompass an entire state; or, in the case of the Agricultural Worker service areas, they may span areas that cover multiple states.5In 2016, there were 193 service areas defined across the 50 states; Washington, D.C.; and the territories: 133 Basic Field – General service areas, 27 Basic Field – Native American service areas, and 33 Basic Field – Agricultural Worker service areas. Figure 1 shows the relative percentage of the population in households below 100% of the Federal Poverty Line in the 133 Basic Field – General service areas, with darker shading indicating a larger poverty population. At the state level, poverty populations ranged from about 64,000 (in Wyoming) to 6.7 million in California (Figure 2). For more detail see Appendix Table A1. At the state level, allocations for Basic Field grant funding ranged from $612,667 in Wyoming to about $43.6 million in California.9 At the service area level, allocations ranged from $16,099 (Native American service area CT-1 in Connecticut) to $11,738,149 (General service area NY-9, in New York City). The median Basic Field – General grant was $1,639,050. The median Native American grant amount was $177,694, and the median Agricultural Worker grant amount was $152,389. A sub-state regional planning or coordination agency composed of sub-state areas whose governing boards are controlled by locally-elected officials. In 2016, 134 legal service organizations received Basic Field Grants. 131 grantees had Basic Field – General grants to provide services to one or more service areas. All 31 Agricultural Worker grantees were also Basic Field grantees, and all but three of 25 Native American grantees were also Basic Field–General grantees. LSC’s FY 2016 congressional appropriation was $385 million (Table 1), including $352 million for the three types of Basic Field Grants. In FY 2015, LSC’s appropriation was $378 million,* and in FY 2014 it was $370 million. In 2016, more than 93% of LSC’s FY 2016 appropriation was awarded to grantees across LSC’s various programs, with grantees reporting receiving $383,408,252 from LSC, including derivative income and carryover funds from previous financial years.11 LSC funding represented 36.8% of the total funding LSC grantees received of $1,041,956,237(Table 2). LSC funding declined from 2010 until 2013. Since 2011, non-LSC sources of funding have made up an increasing part of grantees’ funding (Figure 3). LSC funding (including carryover funds) increased from 2015 by 3.3% in 2016. By comparison, non-LSC funding increased by 9.1%. Since 2011, non-LSC sources of funding have made up an increasing part of grantees’ funding, rising from 56.7% in 2011 to 63.2% in 2016. 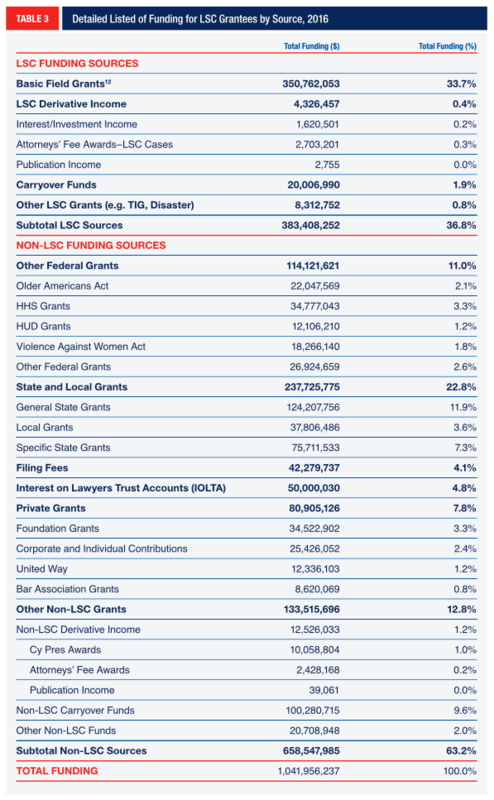 State and local grantswere the second largest category of funds reported by LSC grantees (after LSC Grants). These grants were 22.8% of LSC grantees’ total revenue and consist of general state grants, local grants, and specific state grants and contracts. Other federal funds, the third largest source of funds (11.0%), includes U.S. Department of Health and Human Services grants, U.S. Department of Housing and Urban Development grants, Older Americans Act, Violence Against Women Act, and other federal grants. The remaining funds came from private grants(such as United Way grants, corporate and individual contributions, private foundation grants, and bar association grants), Interest on Lawyers Accounts (IOLTA), filing and other fees, and other (non-LSC) grants. A detailed breakdown of funding sources is presented in Table 3. A summary of funding sources for each grantee is presented in Table 4. For the third year in a row, total funding for programs receiving Basic Field – General grants increased, 7.0% from 2015. The vast majority (96.9%) of LSC and non-LSC funds went to Basic Field – General service areas, with the Native American and Agricultural Worker service areas receiving the remaining 3.1% of funds. 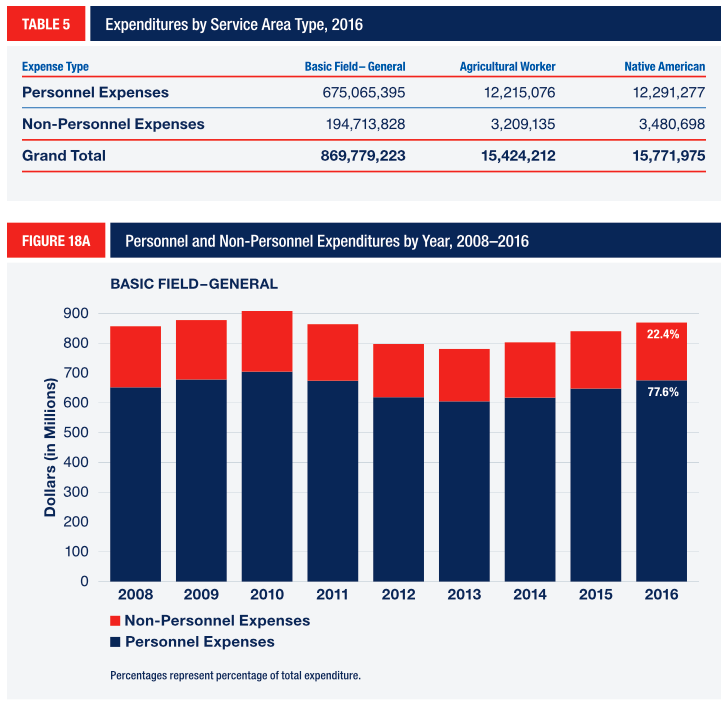 About a third of total funding for Basic Field – General service areas came from LSC sources in 2016. The 131 grantees with Basic Field – General grants reported total funding of $1,009,172,203 in 2016. Of that amount, $358,576,685 (35.5%) came from LSC sources, including $329,293,401 in funding for Basic Field – General grants, and $29,283,284 in other funding (such as Technology Initiative Grants [TIG], and carryover funds). The remainder, $650,595,518 (64.5%), came from non-LSC funding sources. In contrast to the Basic Field – General service areas, LSC grants make up the majority of funds in Native American and Agricultural Worker service areas. In 2016, programs in Native American service areas reported total receipts of $10,14 3,213 from LSC, including $9,863,235 in Basic Field – Native American grants. For these 25 service areas, LSC funding accounted for almost two-thirds of the reported funding (64.8%). Similarly, the overwhelming majority of funding for Agricultural Worker service areas came from LSC funding (85.7%). These 31 service areas reported receipt of $14,688,354 from LSC, including $11,605,417 in Basic Field – Agricultural Worker grants. For the third year in a row, total funding for programs receiving Basic Field – General grants increased, 7.0% from 2015 (Figures 5a and 6). 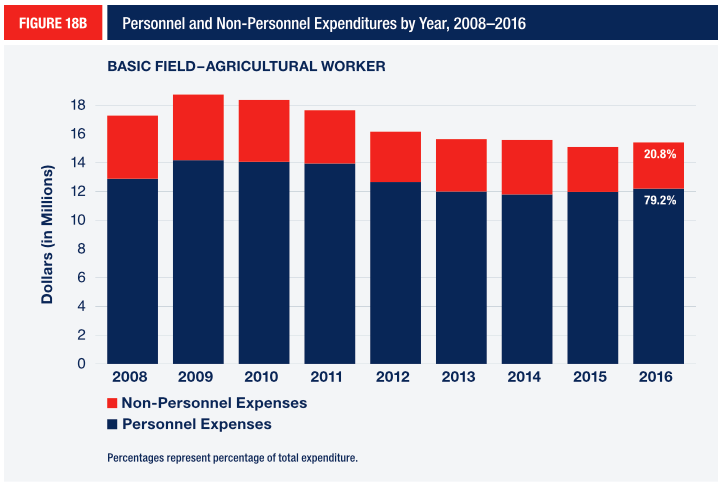 For the first time in six years, total funding reported by programs receiving Agricultural Worker grants increased, by 4.5%, though funding remained well below 2008 levels (Figure 5b). 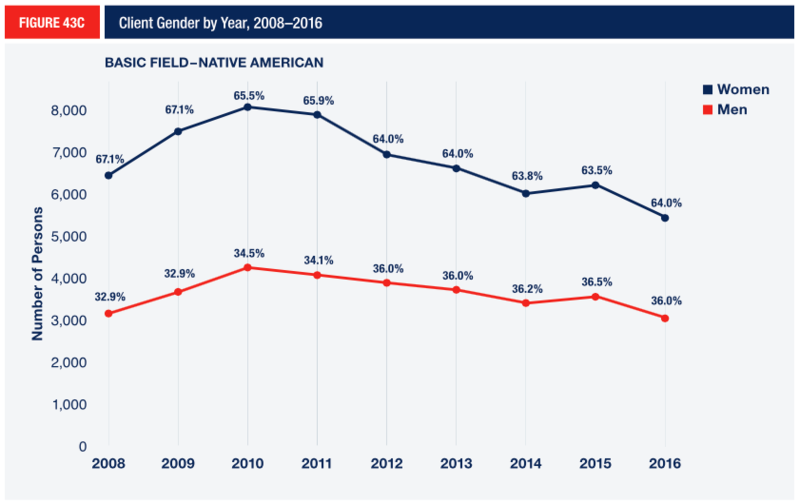 After a major decline in funding in 2012, total funding reported by programs receiving Native American grants has been relatively stable, though still below 2008 levels (Figure 5c). In this section, we limit our analysis to the 133 Basic Field – General service areas. The drivers of the increased funding reported by programs in Basic Field – General service areas since 2012 include increases in funds from state and local grants as well as private grants (for example, from private charitable foundations) (Figure 7). In 2016, the largest source of non-LSC funds for Basic Field – General service areas was state and local grants ($234.6 million), a 2.1% increase from 2015. State and local grants accounted for more than one-third (36.1%) of Basic Field – General grantees’ non-LSC funds in 2016. LSC has long collected data on local grants and general state grants for the provision of legal services, and in 2012 began collecting data on state grants and contracts for specific purposes, such as grants for legal assistance to the homeless. Since 2012, Basic Field – General service areas as a group have received an increasing amount from general state grants and specific state grants and contracts (Figure 8). Grants from local authorities have not increased over the same period, and remain significantly lower than they were in 2008. Grantees in New York received the most funds from state and local grants ($49,555,734). The median amount of funding received from state and local sources in a state or territory was $1,051,666. LSC grantees also report funds received from Interest on Lawyers Trust Accounts (IOLTA).13 Every state, along with the District of Columbia and the Virgin Islands, operates an IOLTA program. Revenue from IOLTA programs declined steadily between 2008 and 2015 due to lowered interest rates (Figure 9). In 2016, IOLTA funds increased from $43.0 million in 2015 to $49.5 million (a 15.1%, increase). IOLTA funds made up 4.9% of the total funding for grantees receiving Basic Field – General grants. Grantee receipts from private funds have increased steadily since 2012 (Figure 10). While receipts from United Way grants have slowly declined, receipts from private foundations returned gradually to 2008 levels. In 2016, receipts from private foundation grants increased by 14.8% compared to 2015. In 2012, grantees began reporting funds received directly from corporations, law firms, and individuals. Receipts of these funds have trended upwards, though in 2016 grantee receipts from corporate and individual contributions declined slightly. At the state level, the median of the total funding for grantees receiving Basic Field – General grants was $9,673,593, with grantees in New York reporting total funding of $140,502,472 and the grantee in Wyoming reporting $990,672. More detail is contained in Appendix Tables A5 and A6. Increases in non-LSC sources of funding are the major drivers of funding change nationally, accounting for 83.8% of the increase in funding for grantees receiving Basic Field – General grants from 2015 to 2016. Compared to 2015, Basic Field – General programs in Florida, Montana, and American Samoa experienced the largest percentage growth in funding, while grantees in Michigan, Puerto Rico, and Colorado experienced the largest decreases in their total funding (Figure 11). 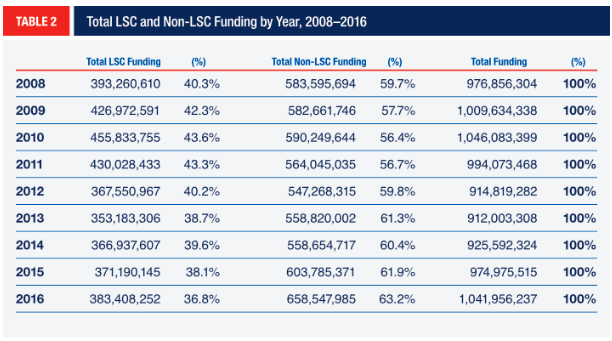 Increases in non-LSC sources of funding are the major drivers of funding change nationally, accounting for 83.8% ($55.4 million) of the increase ($66.1 million) in funding for grantees receiving Basic Field – General grants from 2015 to 2016. At the state level, non-LSC funding increased the most in Florida (111.5%) and Vermont (66.0%).14 Figure 12 maps the percentage change in non-LSC funding at the state level. States colored blue saw an increase in non-LSC funding of more than 5%, while non-LSC funding decreased by 5% or more in states colored red. 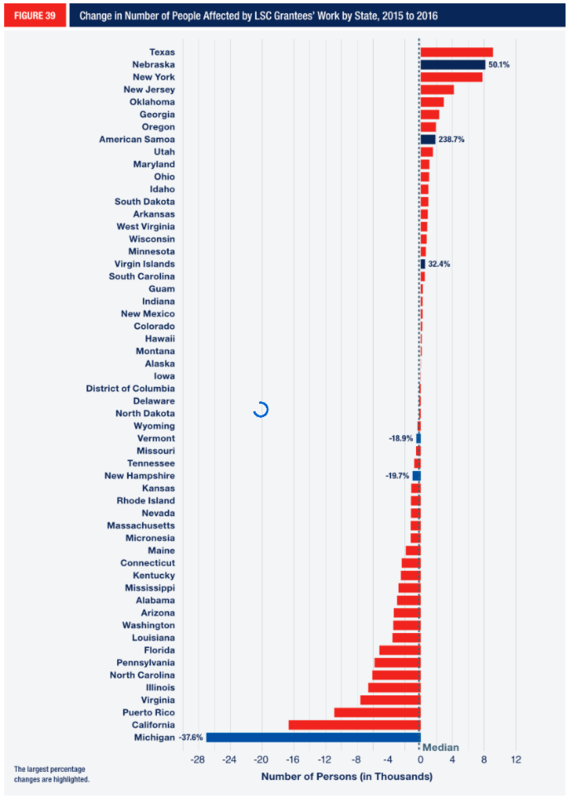 White states reflect moderate changes in funding (–5% to 5% change). In addition to providing detailed reports of revenue by source, LSC grantees provide detailed reports of their expenditures of both LSC and non-LSC funds. 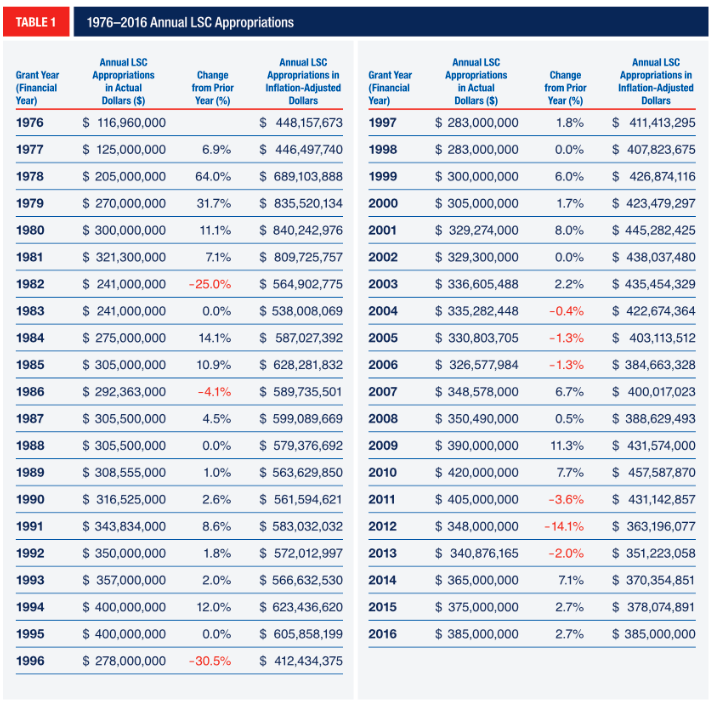 Nationally, LSC grantees’ expenditures have followed funding trends, increasing slightly since 2013 after a period of decline beginning in 2010. In 2016, LSC grantees, across all three Basic Field service area types, reported spending $900,975,410. 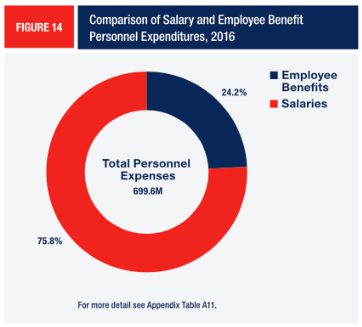 Personnel Expenditures made up the largest category of grantee expenses (77.6%) in 2016 (Figure 13). The national total for personnel expenses was $699,571,748. As may be expected, staff salaries made up three-quarters (75.8%) of the personnel expenses. Benefits made up the remaining quarter (24.2%) (Figure 14). Expenditures relating to salaries have slowly trended upwards since 2013, largely due to increased expenditures on lawyers. Expenditures on lawyers’ salaries have increased by 9.8% since 2008, and in 2016 were $18.5 million (6.0%) higher than in 2015. 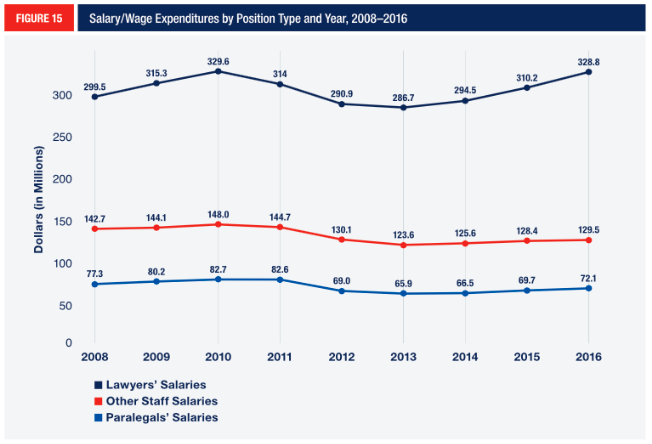 Expenditures on paralegal and other staff salaries declined between 2010 and 2013 (Figure 15), but have gradually increased since. In 2016, grantees reported a total of $201,403,662 in non-personnel expenses, which includes all contract services to clients (such as payments to private attorneys), litigation expenses, office space expenses, operating expenses, training fees, travel expenses, office supplies, and other expenses. Figure 16 highlights the top five non-personnel expenditures reported in 2016. The largest expense was contract services to clients (18.2% of total non-personnel expenses, or $36.6 million), which includes all payments to private attorneys and other entities that provide legal services to clients, including any subgrants made by grantees. The next largest expenditure was office space ($36.4 million). In 2016, most grantee offices were leased. The median expense reported for rent per grantee in 2016 was $182,596. 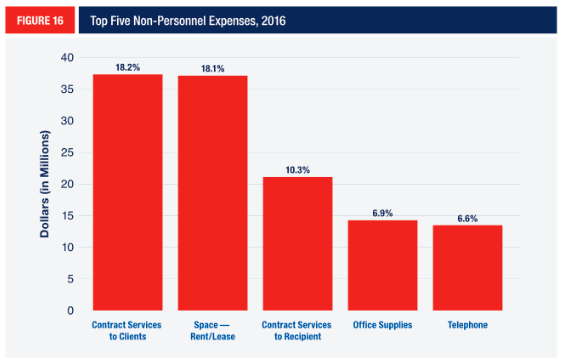 The third largest non-personnel expenditure was contract services to recipient ($20.7 million), which include services to the grantee such as legal counsel, consultant fees, and bookkeeping. 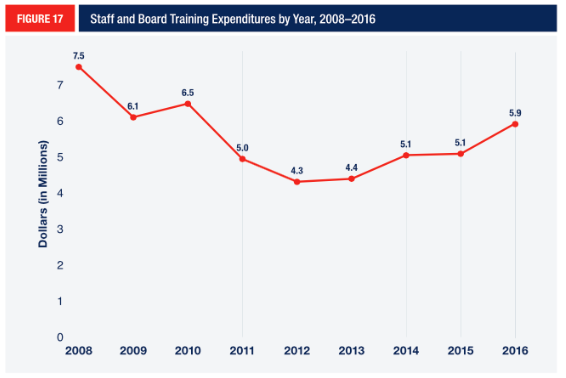 Since 2012, staff and board training expenditures have increased by 37.5%, but have not reached their 2008 peak of $7.5 million (Figure 17). Training includes: learning how to read financial, statistical, and other reports; understanding substantive law that affects clients; receiving legislative updates on developments impacting clients and client services; and improving leadership capacity. Grantees in Basic Field – General services areas expended $869,779,223 in 2016. Programs in Agricultural Worker and Native American service areas operate at a significantly smaller scale due to the smaller eligible populations. In 2016, Native American programs spent $15,771,975 and Agricultural Worker programs spent $15,424,212 (Table 5). Expenditures for Basic Field – General and Native American grants have grown since 2013. Total expenditure of grantees receiving Basic Field – General grants has returned to 2011 levels (Figure 18a). Expenditures in Agricultural Worker service areas have been slower to rebound (Figure 18b). 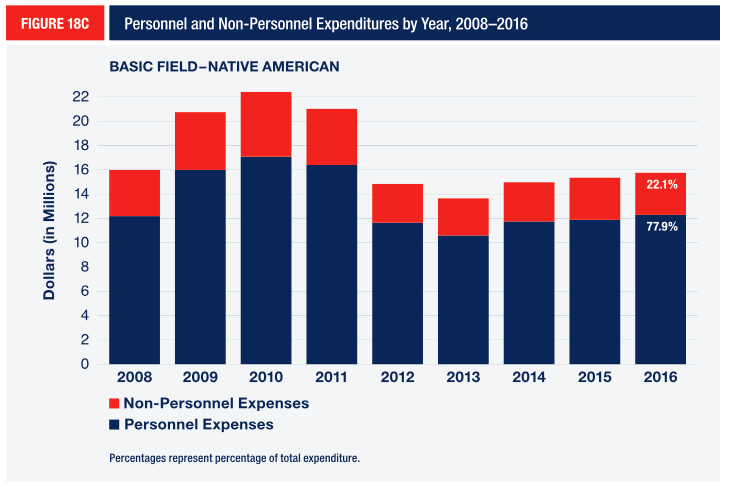 Increases in Basic Field– General and Native American service area expenditures are largely due to increases in personnel expenses. Increases in available funding after 2013 were largely channeled toward personnel expenditures. 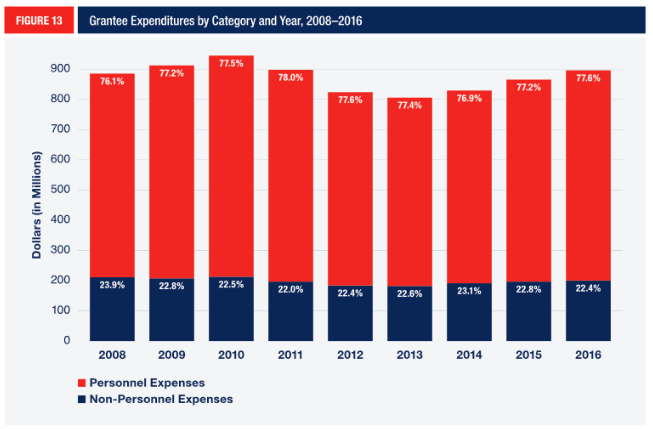 Non-personnel expenses have not increased significantly since 2013, and are at or below 2008 levels in all three service area types. For more details of grantee expenditures supported by LSC funding by state/territory and category see Appendix Tables A7–A9. In addition to handling cases for clients, LSC grantees provide many other services to address the basic civil legal needs of low-income clients, including holding legal education workshops, providing self-help resources, referring people to other social services, and developing self-help and legal information resources. The total number of case closures tends to track LSC funding, although the relationship has become weaker in the last two years (Figure 19). A case, for reporting purposes, is defined as the provision of LSC-permissible legal assistance to an eligible client with a legal problem or a set of closely related legal problems that fall within the requirements of the Legal Services Corporation Act of 1974, appropriations acts, regulations and other applicable laws. LSC grantees are asked to record and report the provision of legal assistance if: (1) the client meets all eligibility requirements; (2) the client’s case is within program priorities; and (3) the legal services program has actually accepted the client for service through procedures that ensure client eligibility. To be counted as a case, the legal assistance that is provided to clients must be specific to the client’s unique circumstances and involve legal analysis that is tailored to the client’s situation. Simply relaying legal information, such as through pamphlets and brochures, is not considered legal assistance and is not reported in grantee case counts. For national reporting purposes, legal problems are classified into 11 different issue areas: Consumer/Finance, Education, Employment, Family, Juvenile, Health, Housing, Income Maintenance, Individual Rights, Juvenile, and Miscellaneous. Among the different issue areas, Family and Housing case closures made up the bulk of the case closures in 2016, comprising 32.0% and 28.3% of case closures, respectively (Figure 20a). The Income Maintenance and Consumer/Finance problem categories comprise the third and fourth largest components of total case closures at 10.6% and 9.9%. Much of the 19,370 case drop in the number of case closures was in Family, Housing, and Consumer/Finance cases. In 2016, there were 5,441 (2.3%) fewer Family case closures, 5,403 (2.5%) fewer Housing case closures, and 4,996 (6.4%) fewer Consumer/Finance case closures than in 2015 (Figure 20b). A case closure falls under the Counsel and Advice category if the program provided legal advice to an eligible client. Cases are considered to be of Limited Action when the program took action to address the client’s legal problem, but the action was not so extended as to meet LSC requirements for an extended service case. Examples include: communications by letter, telephone, or other means to a third party or preparation of a simple legal document such as a routine will or power of attorney. The Negotiated Settlement without Litigation category involves cases in which a program negotiated and reached an actual settlement on behalf of a client without any pending court or administrative actions. Negotiated cases in which an actual settlement was reached while a court or formal administrative action was pending fall under the Negotiated Settlement with Litigation category. The Administrative Agency Decision category involves cases in which the program represented a client in an administrative agency action that resulted in a case-dispositive decision by the administrative agency or body, after a hearing or other formal administrative process. Cases are closed under the Court Decision category when a program represented a client in a court proceeding that resulted in a case-dispositive decision made by the court. Court decisions may be (1) uncontested, (2) contested, or (3) appeals. Other case closures involve cases closed that do not fit into other case closure categories. Extensive Service case closures involve cases in which the program undertook extensive research, preparation of complex legal documents, extensive interaction with third parties on behalf of an eligible client, or extensive on-going assistance to clients who are proceeding pro se. 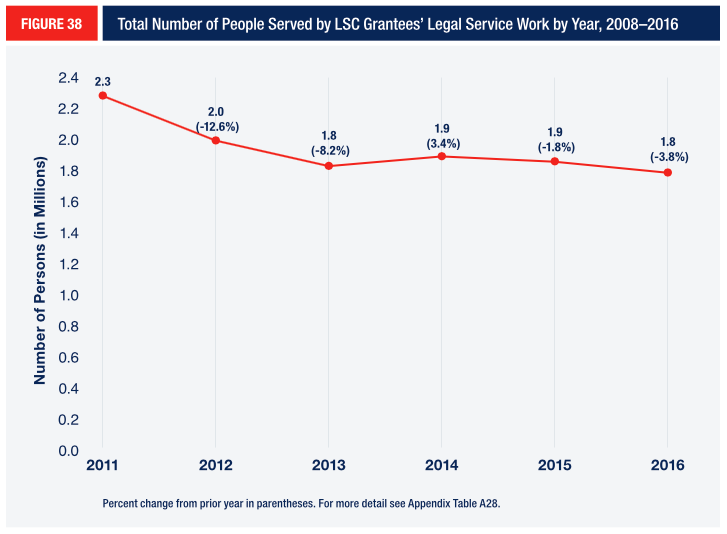 In 2016, Limited Service Cases made up 76.0% of all cases reported by LSC grantees, with the remaining 24.0% reported as Extended Service. Among the Limited Service cases, 77.8% were reported as Counsel and Advice (Figure 21). Among Extended Services cases (Figure 22), one-third (33.3%) involved negotiated settlements in 2016, most with litigation (26.0%). Uncontested court decisions were 21.2% of Extended Service cases closed. Cases closed under Other Closure Methods and Court Decision Appeals make up a very small percentage of total cases closed, at 0.3% and 0.1% respectively. The number of case closures from Basic Field – General grants constitutes nearly all case closures (724,521, or 98.4% of all case closures in 2016). Case closures from Native American and Agricultural Worker grants comprise 1.2% (8,638) and 0.4% (3,245) of total case closures respectively. Case closures have declined in all three service area types since 2010 (Figure 23). The distributions of problem categories differ across Basic Field grant types. For Basic Field – General service areas, a majority of case closures were either Family (32.1%) or Housing (28.7%) cases in 2016 (Figure 24). However, for Basic Field – Agricultural Worker grants, Employment (61.9%) and Income Maintenance (14.7%) were the leading issue areas addressed by programs. 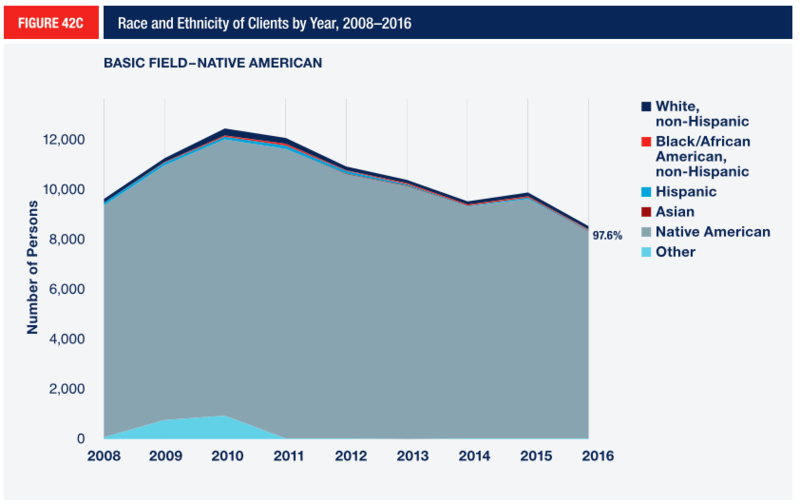 For Basic Field – Native American grants, Family, Miscellaneous, and Employment-related case closures make up 31.8%, 29.4%, and 11.0% of total case closures respectively. The distributions of closure categories also differ by type of service area (Figure 25). For example, case closures under Limited Action occur more frequently in Basic Field – Agricultural Worker and Native American service areas, than they do for the Basic Field service areas. Case closures under the Agency Decision (10.3% of cases closed), Extensive Services (6.9%), and Negotiated Settlement without Litigation (6.0%) codes figure more prominently in Agricultural Worker service areas. In Native American service areas, more cases were closed after Limited Action (29.8%) and Extensive Services (8.8%) than in other service area types. Although the number of case closures has dropped nationally, in 21 states and three territories the number of case closures increased from the previous year. 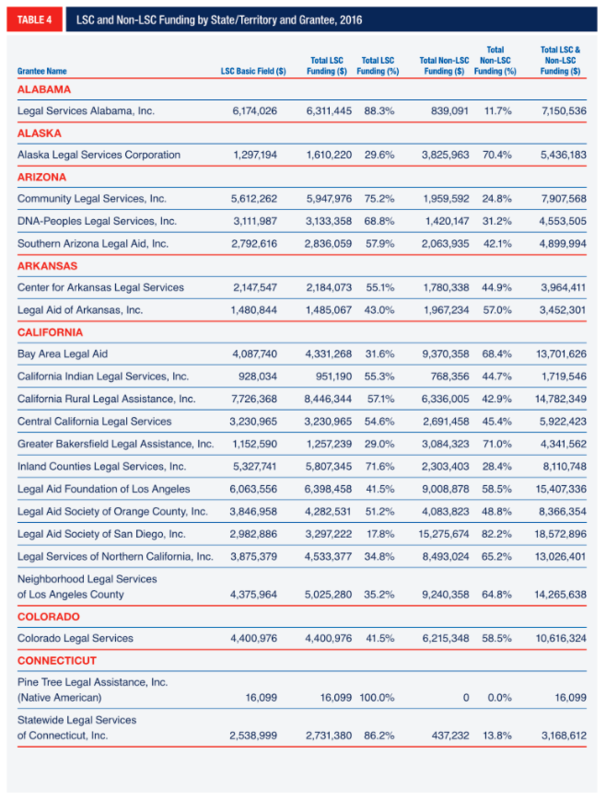 The number of cases closed by LSC grantees in each state, territory, and D.C. varies considerably, from over 80,000 in California to 328 in Guam. Although the number of case closures has dropped nationally, in 21 states and three territories the number of case closures increased from the previous year. Excluding the territories,18the largest percentage increases in case closures reported by states from 2015 occurred in South Dakota (19.5%), Montana (13.6%), and Utah (11.4%), while the largest percentage decreases in case closures occurred in Michigan (33.3%), New Hampshire (19.3%), and Connecticut (14.9%) (Figure 26). For state-level detail on case closures, see Appendix Table A15. For detail on case closures by reason for closure, see Appendix Table A16. Grantees report on three categories of activities as part of “other services:” Community Legal Education; Pro Se Assistance; and Referrals. In addition to accepting client cases, LSC grantees offer a range of other services, including clinics, legal education workshops, pro se self-help materials, and referrals. Many grantees have designed interactive websites with useful legal resources, such as legal forms and guidance materials, which are used by hundreds of thousands of people each year. Grantees report on three categories of activities as part of “other services:” Community Legal Education; Pro Se Assistance; and Referrals. Community Legal Education activities aim to inform community members about their legal rights and responsibilities. Pro Se Assistance activities involve providing information and assistance to people handling legal matters without assistance from an attorney. Referrals occur when the grantee (or PAI attorneys) refer an otherwise eligible person to another organization or agency without providing legal advice. Grantees provided other services to a total of 1,159,657 persons.19Two in five (41.2%) of these people were reached through Pro Se Assistance activities (Figure 27). Another two in five (37.6%) were referred to a different organization or agency. The remainder participated in legal education activities (21.1%). The total number of persons reached reflects the size of the programs — in California, grantees reached 364,000 people; in Wyoming, the grantee reached about 1,000 people. There is considerable variation in the types of outreach activities performed by grantees (Figure 28). Grantees in California reached proportionally more people via Pro Se Assistance activities, which made up 57.4% of all persons reached through other services in California, compared to grantees in other states. Pro Se Assistance constituted only 2.3% and 14.7% of persons reached in Texas and New York, respectively. In 2016, more than 18.5 million unique visitors accessed grantees’ websites, downloading 6.4 million legal education materials and two million self-help resources. Pro Se Assistance comes in multiple forms. Almost half (47.0%) of people LSC grantees reached while engaging in Pro Se Assistance were assisted at a court’s help desk (Figure 29). LSC grantees assisted another 26.5% at workshops or clinics. When LSC grantees made referrals in 2016, they most often (46.5%) referred people to private attorneys (Figure 30). One in four (26.3%) people was referred to another legal services provider. 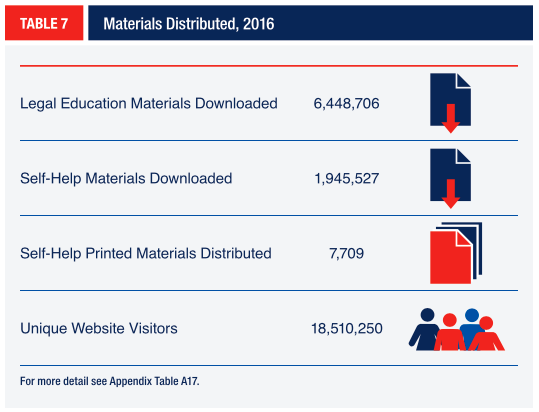 In 2016, more than 18.5 million unique visitors accessed grantees’ websites, downloading 6.4 million legal education materials and two million self-help resources (Table 7). More than 7,700 copies of printed self-help materials were distributed. Private Attorney Involvement (PAI) is an integral part of service delivery for all LSC grantees and is designed to provide high-quality, economical, and effective client-centered legal assistance and legal information to eligible clients. LSC grantees leverage federal funding and maximize the number of clients that they serve by involving private legal Professionals (including private attorneys, paralegals, law students, and other legal professionals) in the delivery of legal services, primarily on a volunteer basis. Private legal professionals assist grantees by taking cases, acting as co-counsel in complex cases, providing information and advice at clinics, providing hotline advice, training staff, helping with transactional work (real estate, wills, and estates), and in a variety of other ways. LSC regulations require all grantees to devote an amount equal to at least 12.5% of their annualized Basic Field – General award to encourage the involvement of private attorneys, law students, law graduates, or other professionals in the delivery of legal information and legal assistance to eligible clients. Although private legal professionals may be involved in cases under Basic Field – Native American grants and Basic Field – Agricultural Worker grants, LSC grantees do not report these cases. The data in this section are presented for Basic Field – General service areas only. Pro bono attorneys close the vast majority of PAI cases: pro bono PAI cases represented 84.4% of total PAI case closures in 2016 (Figure 31a). 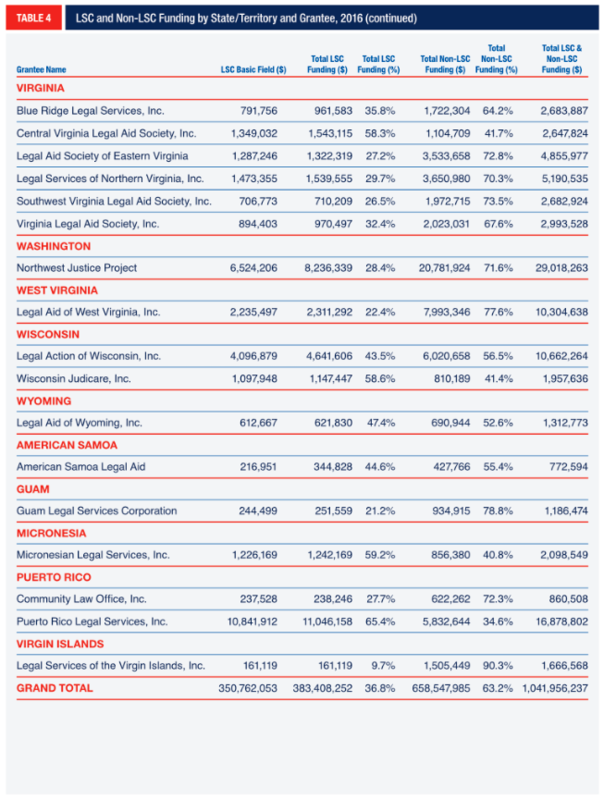 In 39 states, D.C., and Puerto Rico, pro bono cases made up the majority of PAI cases closed (Figure 31b). There were 73,627 pro bono PAI cases closed, or 10.0% of all Basic Field Grant – General case closures. The proportion of total case closures that involve pro bono attorneys has increased since 2011, when pro bono case closures constituted 8.8% of all Basic Field – General case closures (Figure 32). Most PAI case closures for Basic Field – General service areas were Limited Service cases (Figure 34a). PAI case closures have decreased in number from their 2010 peak (Figure 34b). In North Dakota, Delaware, and Maine, the vast majority of PAI case closures are in Extended Service cases (Figure 34c). By contrast, in California, Washington, and Florida, only a small proportion of PAI case closures were Extended Service cases. More than half of PAI Extended Service case closures were court decisions (Figure 35a), 39.4% were uncontested court decisions, 15.2% were contested, and 0.2% were appeals. Of the 58,361 PAI Limited Service case closures, more than two thirds (68.8%) were Counsel and Advice cases (Figure 35b). In 2016, 87,322 (12%) of the 742,521 case closures for Basic Field – General grants involved private legal professionals. The composition of case closures by problem category differs between PAI and staff cases. For PAI case closures, Family, Consumer/Financial, and Miscellaneous categories constitute a higher percentage of total case closures than staff case closures, while Housing and Income Maintenance case closures make up a smaller share (Figure 36). The vast majority (96.4%) of professionals that accepted one or more PAI cases were private attorneys (Figure 37). Less than 3% were law students and graduates, and less than 1% were paralegals or other professionals. LSC grantees report the total number of adults and children in each household they serve. 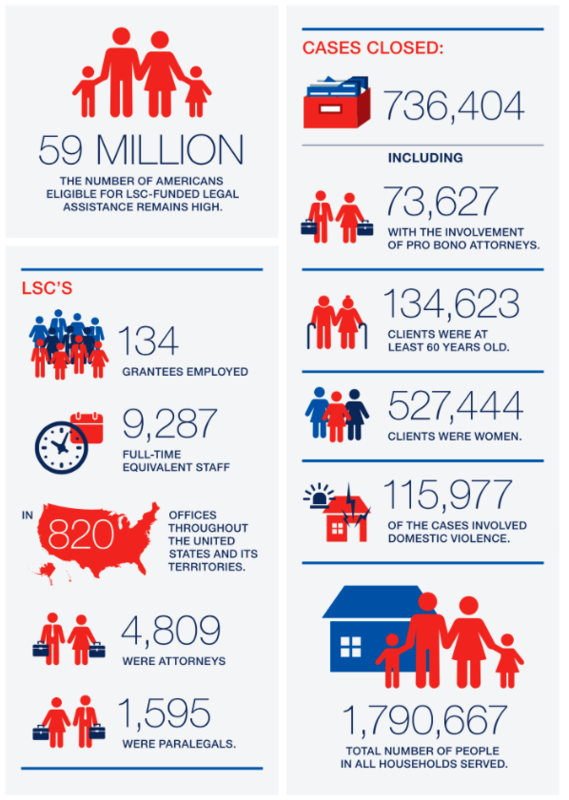 These counts provide an estimate of the number of people served by LSC grantees. 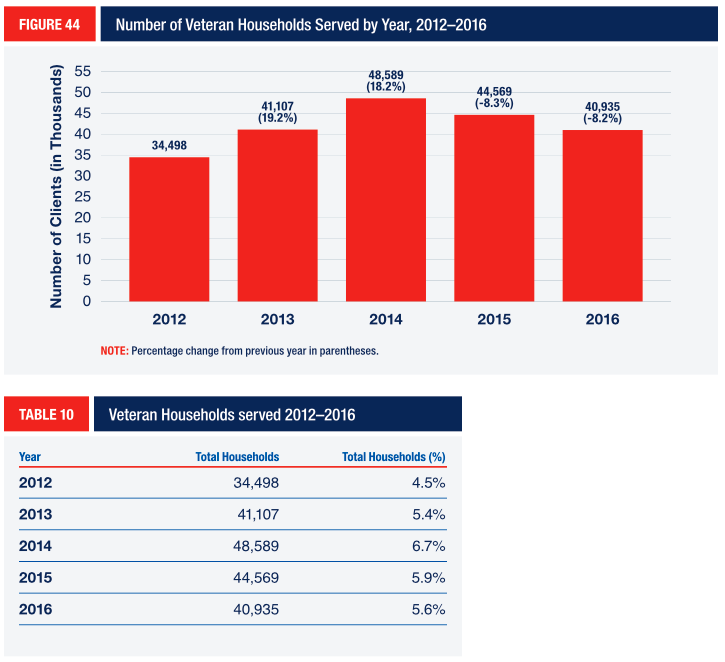 In 2016, the total number of persons served across all households was 1,790,667 (Figure 38). More than half of these household members (57.7%) were adults and the remaining 42.3% were children under 18. Figure 38 displays the aggregate number of persons served each year across all Basic Field programs. Table A28 provides the number of persons served from 2012 to 2016 and the percentage change from year to year. In addition to individuals, LSC grantees also provide services to groups, corporations, associations, or other entities that are composed of individuals who are financially eligible for LSC-funded legal assistance or responsible for the delivery of services to those persons in the community. In 2016, LSC grantees served 519 group clients. 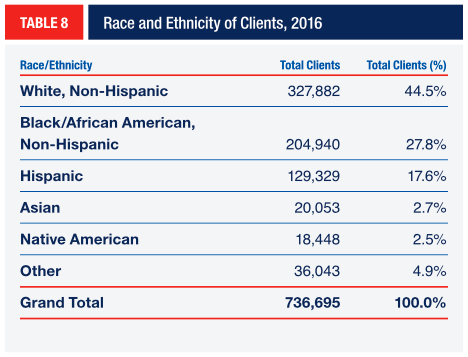 Across all three types of Basic Field Grants, 44.5% of clients identified as White, non-Hispanic; 27.8% identified as African American, non-Hispanic; and 17.6% identified as Hispanic in 2016 (Table 8). 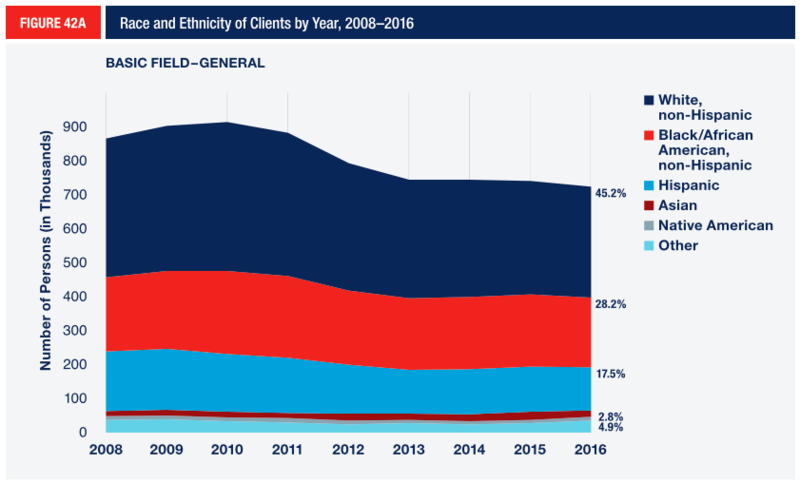 An additional 2.7% of clients identified as Asian, 2.5% identified as Native American, and 4.9% identified as Other. 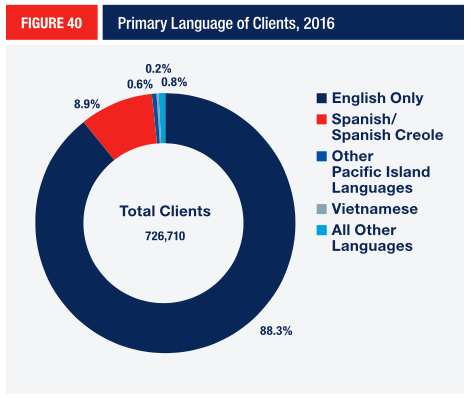 Grantees reported that the primary language of the overwhelming majority of their clients was English (88.3%) (Figure 40), followed by Spanish or Spanish Creole (8.9%), Pacific Island Languages (0.6%), Vietnamese (0.2%), and all other languages (0.8%). 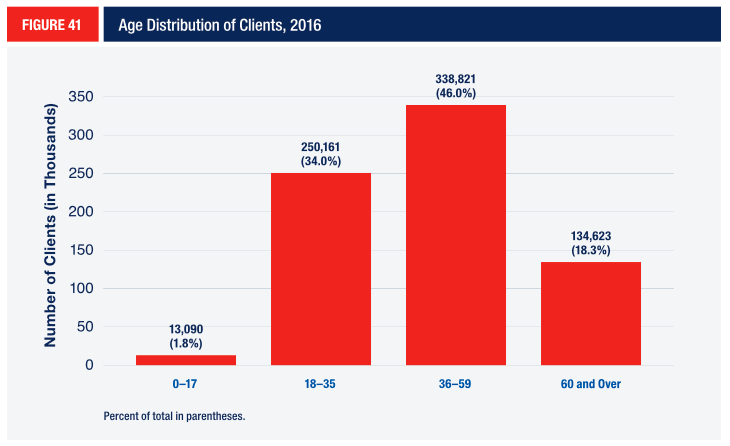 Almost half of clients served (46.0%) are between 36 and 59 years of age, with adults aged 18-35 making up almost one-third of clients (34.0%) (Figure 41). Seniors aged 60 and over were 18.3% of clients and children under 18 years were 1.8% of clients. The age distribution of clients has not greatly changed over time. The number of senior clients (60 and over), however, has been increasing since 2014, with a 12.0% increase from 120,182 seniors in 2014 to 134,623 in 2016. Client characteristics for grants that target specialized populations are very different from client characteristics for Basic Field – General service areas. (Figures 42–43). Grantees in Native American service areas served 8,533 clients, the majority of whom (97.6%) identify as Native American (Figure 42). Like LSC Basic Field grant clients generally, their primary language was English (89.7%), and clients were predominantly women (64.0%) (Figure 43) and aged between 36 and 59 (41.8%). Grantees in Agricultural Worker service areas serve the fewest clients of the three service area types (3,243). Client demographics differ greatly from Basic Field and Native American service areas. 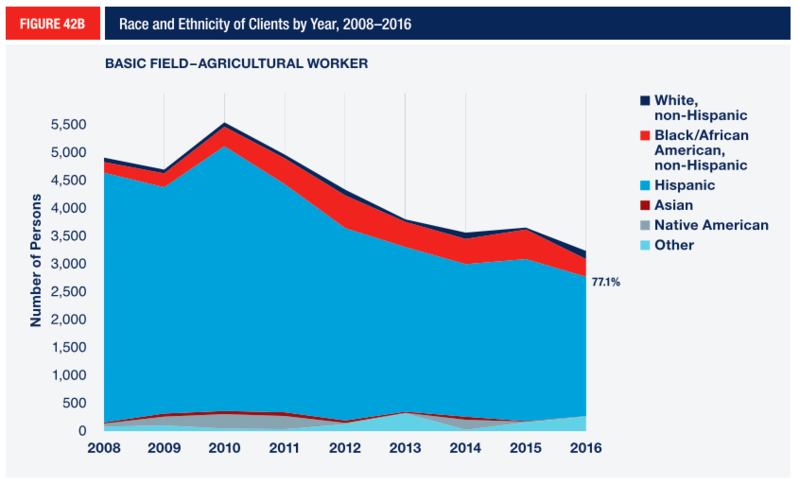 For Agricultural Worker service areas, clients identifying as Hispanic were the dominant ethnic/racial group, making up 77.1% of clients served (Figure 42). In 2016, Spanish or Spanish Creole was the most common language of clients in Agricultural Worker service areas (73.2%), while clients speaking English composed 17.6%. 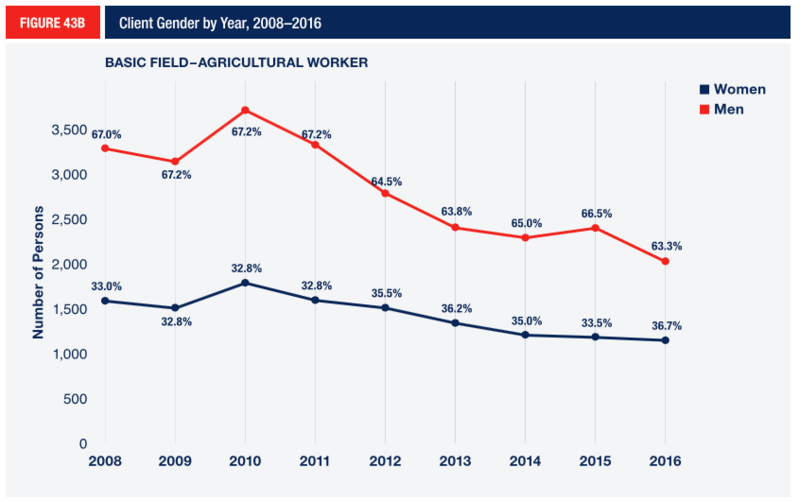 Unlike Basic Field and Native American service areas, grantees in Agricultural Worker service areas served mostly men (63.3%) (Figure 43), which is consistent with previous years. LSC defines veteran households as any household with at least one member who is a veteran. Veterans are not evenly distributed across the United States, and neither are LSC-funded legal services for veterans. 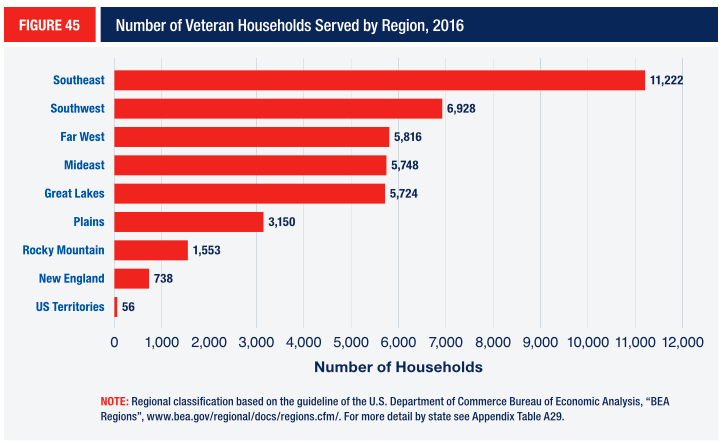 Figure 45 highlights the location of veteran households served by LSC grantees in nine regions defined by the Bureau of Economic Analysis,28showing that 44.3% of veteran households are in the 16 states in the southeast (Alabama, Arkansas, Florida, Georgia, Kentucky, Louisiana, Mississippi, North Carolina, South Carolina, Tennessee, Virginia, and West Virginia) and southwest (Arizona, New Mexico, Oklahoma, and Texas) regions. In 2016, LSC grantees located in these 16 states served 18,150 veteran households, with Texas serving the most households (5,369). It is difficult to know exactly how many survivors of domestic violence LSC grantees help. Clients may come in for other legal problems that flow from domestic violence, such as income maintenance or homelessness, and some may try to keep the violence hidden. LSC grantees report two key measures that give important insight: the number of cases involving domestic violence and the number of domestic abuse cases closed. LSC grantees categorize cases as “cases involving domestic violence” if a domestic violence incident is related to the legal issues of the case in any way, even peripherally. Cases are categorized as “domestic abuse cases” if the legal issue at the center of the dispute is related to domestic violence, such as when a protection order is sought. In 2016, LSC grantees reported 115,977 cases involving domestic violence. 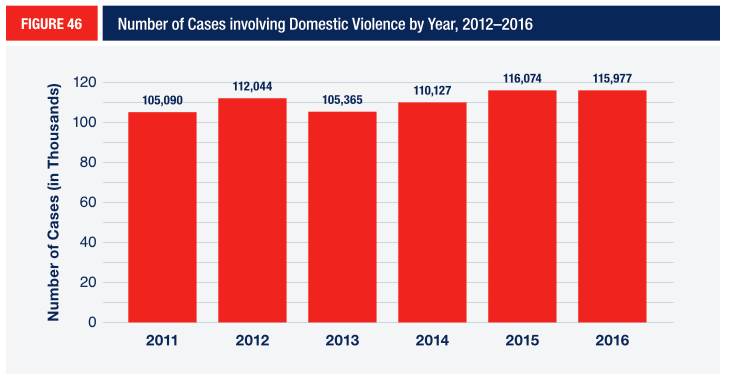 This is a slight decline (0.1%) since 2015, but the number of cases involving domestic violence has been trending upward since 2011 (Figure 46). In 2016, LSC grantees reported closing 47,526 domestic abuse cases, making it the third most common subcategory of family-related cases closed (after Divorce/Separation/Annulment and Custody/Visitation). LSC grantees vary considerably in terms of size, capacity, and scope of service delivery. Below is a brief description of characteristics of staff across the 134 grantees in 2016. In 2016, grantees managed 820 offices29with a total full-time equivalent (FTE) staff count of 9,287.30 Each grantee manages at least one office, and the most offices of any one grantee are the 22 offices run by Legal Aid of North Carolina. The staff size of each office ranges from one FTE staff (in 30 offices) to 141 FTE staff (Legal Assistance Foundation of Metropolitan Chicago). The median years of professional experience for all grantee staff was 11, but that number was considerably higher for program leadership. Executive directors had a median of 35 years of professional experience. Deputy directors had a median of 29 years of professional experience. Managing attorneys had a median of 22 years of professional experience. Examining office staff by function, we see that more than two-thirds of office staff (67.7%) served a direct legal advocacy function in 2016 (Figure 47), followed by office support staff (23.5%), administrative and management professionals (5.7%), and leadership, executive, and deputy directors (3.1%). The total number of FTE staff employed by LSC grantees declined during the recession and has gradually increased since 2013 (Figure 48). The total number of FTE staff employed by grantees in 2016 remained below its 2010 peak. Since the recession, grantees have hired more advocacy staff (attorneys and paralegals), while continuing to shed office support staff. In recent years, grantees have employed an increasing number of attorneys relative to paralegals. Advocates may be either attorneys or paralegals. Paralegal staff provide support for a variety of functions in legal service programs, performing duties like intake, research, and filings. They also handle cases under the supervision of a licensed attorney and represent clients in administrative hearings. All programs but one have at least one paralegal staff person, including part-time staff. All but eight grantees reported having at least one FTE paralegal on staff. 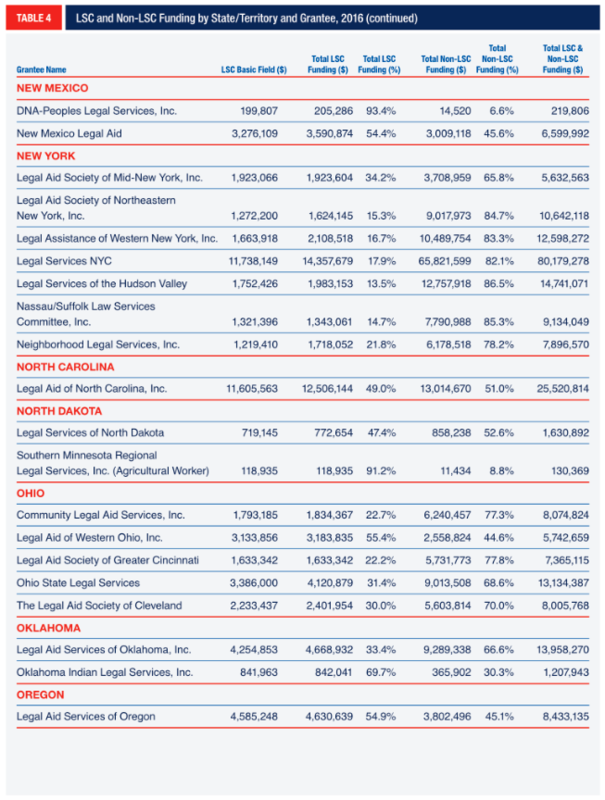 In recent years, grantees have employed an increasing number of attorneys relative to paralegals (Figure 49). The median ratio of attorneys to paralegal staff has increased from 2.7 in 2008 to 3.0 in 2016. 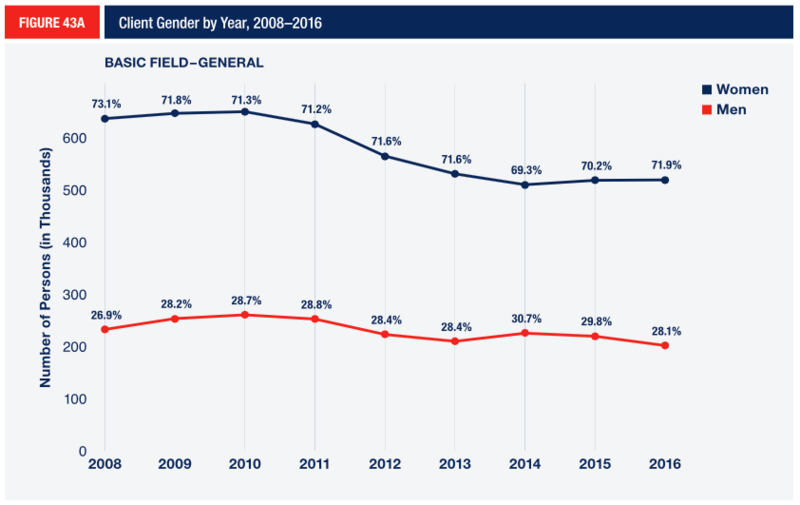 Women make up the overwhelming majority (76.0%) of LSC grantees’ FTE staff (Figure 50). They are the majority in all reported position categories except executive director, director of litigation, and information technology staff. A detailed staffing table listing staff size, median salaries, and years of experience is in Appendix Tables A32–A35. The Grantee Activity Report (GAR) is the largest and longest running data collection effort on civil legal aid in the United States. 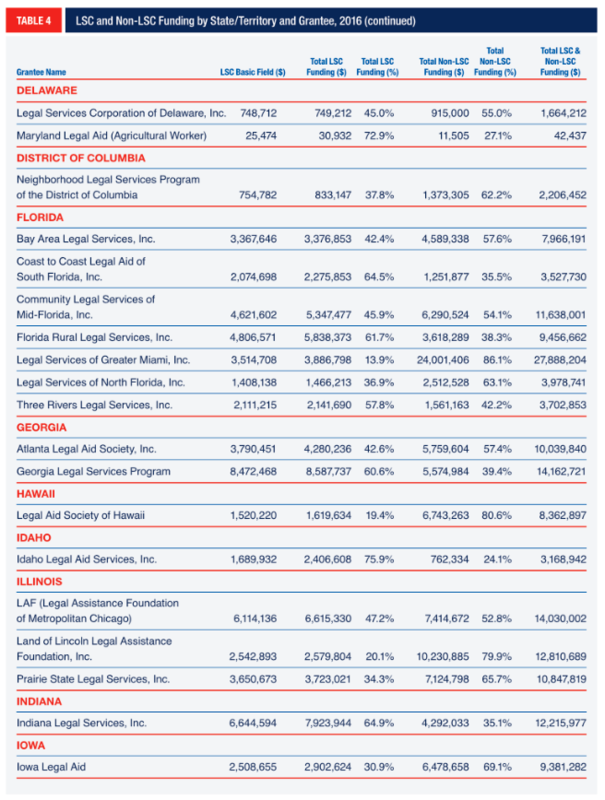 Dating back to 1976, the Legal Service Corporation (LSC) has recorded and reported data from LSC grantees in a variety of ways. The data are gathered annually from all grantees on a calendar-year basis. Grantees use automated reporting forms that are accessible via the Internet. Calendar Year (CY) 2016 Grantee Activity Reports were due to LSC by March 1, 2017. A full copy of the 2016 GAR reporting guidance is available at: https://lsc-live.app.box.com/file/120697313819. In 2016, LSC instituted a comprehensive data validation process. The data validation process consisted of 77 edit checks broken down into two groups: numerical checks and logical checks. The numerical edit checks compared the data reported in 2016 against that data element’s historical average. The logical edit checks compared 2016 data elements against other 2016 data elements to ensure their internal consistency. All LSC grantees were emailed a list of their respective edit checks within two weeks of the GAR deadline. The grantees’ data was then verified. If the data reported were found to be reported in error, grantees were asked to correct the data. If the data reported were correct, grantees were asked to mark that they had verified the data and to provide a brief explanation for why the change occurred. In 2016, there were over 1,400 edit checks sent to grantees, with slightly over 40% of the data elements changed. To see interactive charts and graphs of GAR data, go to www.lsc.gov/grants-granteeresources/grantee-data. To access raw data files for analysis, go to: https://catalog.data.gov/organization/legal-services-corporation. 1 For the two service areas that cover multiple states, data are presented for the state in which the grantee’s head office resides. See note 5 for more information. In Figure 39 data are reported only at the grantee level and cannot be attributed to a state where a grantee operates in multiple service areas. 2 For more information on the Basic Field Grant, see: www.lsc.gov/grants-grantee-resources/our-grantprograms/basic-field-grant. 3 Some of the 27 Basic Field – Native American service areas cover specified Indian reservations, whereas others include territory outside reservations, allowing access for Native Americans who do not reside on reservations. 4 The 33 Basic Field – Agricultural Worker service areas cover areas with significant numbers of agricultural workers, such as the San Joaquin Valley in California. 5 There are two Agricultural Worker service areas that cover multiple states. Service area MMX-1 covers Maine, New Hampshire, Vermont, Massachusetts, Rhode Island, and Connecticut. The grant for MMX- 1 is managed by Pine Tree Legal Assistance. Service area MSX-2 covers Texas, Louisiana, Arkansas, Mississippi, Tennessee, Kentucky, and Alabama. The grant for MSX-2 is managed by Texas Rio Grande Legal Aid. The data for these two service areas are reported in the aggregate and cannot be assigned to an individual state. For reporting purposes, we attributed the data from these two service areas to the home state of the grantee administering the grant (Maine and Texas, respectively). 6 Pub. L. 104-134, Title V, § 501(a), 110 Stat. 1321, 1321-50 (1996), as modified by Pub. L. 113-6, Div. B, Title IV, 127 Stat. 198, 268 (2013) and incorporated by reference thereafter in LSC’s annual appropriations. 7 Note that congressional allocation of funds is based on the poverty population of households at or below 100% of the Federal Poverty Line, while eligibility for LSC-funded legal aid is restricted to households with an income at or below 125% of the Federal Poverty Line. 8 Id. Under the statutory formula, LSC uses other adjusted poverty populations counts for areas without Census Bureau data such as the independent states of Palau, Micronesia, and the Marshall Islands. 9 These data are for General and Agricultural Worker service areas only (because some Native American service areas encompass multiple states). The territories of the Virgin Islands, American Samoa, and Guam (not represented on the map) have smaller poverty populations and Basic Field allocations than Wyoming. 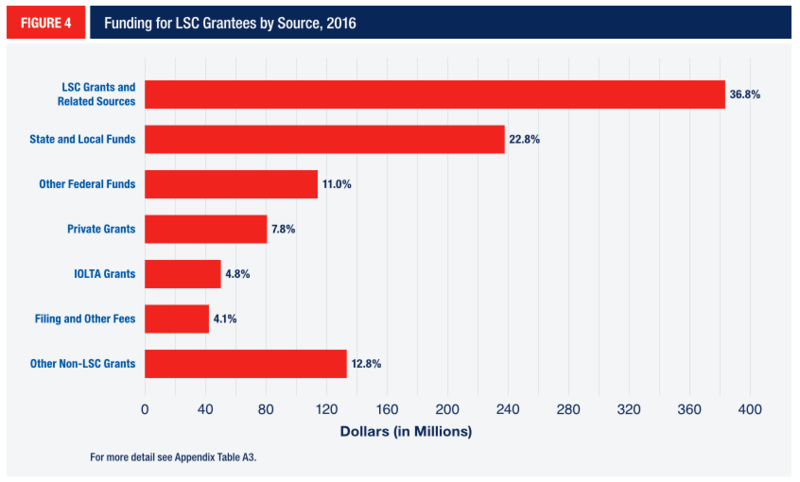 11 The total that LSC grantees receive from LSC exceeds the 2016 Basic Field allocation of $352 million because it includes all amounts from LSC’s 2016 grants (Basic Field Grants and other awards like Technology Initiative Grants and disaster relief), derivative income (interest/investment income), attorneys’ fee awards for LSC cases, and carryover funds. Additionally, LSC grantees report on the 2016 calendar year, whereas congressional appropriations are for the financial year, beginning October 1. 12 The amount grantees received from LSC for Basic Field grants in CY 2016 ($351 million) is different than the FY 2016 appropriation ($352 million) due to different reporting periods and payment timelines. 13 Attorneys routinely receive client funds (commonly referred to as “trust money”) to be held in trust for future use. If the amount is large or the funds are to be held for a long period of time, the attorney customarily places these funds in an interest-bearing account for the benefit of the client. However, in the case of amounts that are small or are to be held for a short time, it is impractical for the attorney to establish a separate account for each client, since the cost of establishing and administering the account would exceed any interest generated and result in a net loss for the client. Prior to IOLTA, these nominal and short-term funds were combined and placed into a pooled, non-interestbearing checking account. Virtually all IOLTA programs in the United States use IOLTA revenue to provide grants to organizations for the purpose of providing legal aid in civil matters to low-income residents; many also use IOLTA revenue for grants to help improve the administration of justice in their states. 14 In American Samoa, non-LSC funding increased 35,257.2%, from $1,210 in 2015 to $427,766. 15 There was a grantee transition in southeastern Michigan (service area MI-13), which resulted in far fewer cases (3,973) than the previous year. This decrease of 8,115 cases represents 41.9% of the overall decline in case closures for 2016. The Puerto Rico service area saw a 3,695 (15.4%) decline in case closures that is directly attributable to the Puerto Rican financial crisis. The third reason is that Legal Aid of North Carolina, a program typically in the top three in case closure totals nationally, saw a 2,395 (11.2%) decline in case closures. This was result of an unexpected reduction in state funding that forced the program to lay off 52 staff during the last four months of 2015. 16 Case closure categories are: Category A – Counsel and Advice; Category B — Limited Action; Category F —Negotiated Settlement Without Litigation; Category G — Negotiated Settlement with Litigation; Category H —Administrative Agency Decision; Category I —Court Decision; Category K —Other Extended Service; Category L — Extensive Service (not resulting in Settlement or Court or Administrative Action). 17 Legal Services Corporation. 2017. Case Service Report Handbook (2008 edition, 2017 Cumulative Revision). Available at: www.lsc.gov/ csr-handbook-2017. 18 Some grantees in the U.S. territories reported large percentage increases in cases closed. However, these increases represented a small increase in the number of cases closed. At the most extreme, American Samoa Legal Aid reported closing 274 more cases in 2016 than in 2015 — and this amounted to a 238.3% increase. 19 In the paragraph on other services, only measured data are reported. For other services, such as legal materials distributed or unique website visitors, grantees can report estimates. These data are excluded. 20 Non-legal service providers are providers of non-legal human or social services. Other sources of assistance are sources where the nature of the provider was not identified in the data. 22 Micronesia and Guam had waivers and therefore did not need to report PAI data. Consequently, they did not report any direct PAI case closures and are omitted from the figures in this section. 24 In southeastern Michigan (service area MI-13), there was a grantee transition that resulted in far fewer closed cases (3,973) than in 2015. 25 The statistics presented in this section provide summary information for the named client in a case, which is why the data tallies to around 736,857 rather than 1.7 million (the number of persons served by LSC grantees’ legal work). In this section, missing data are excluded from the tallies. 26 U.S. Bureau of the Census, special tabulation provided to LSC from the 2015 American Community Survey 1-year estimates, Table B17001. 27These states were: AK, DE, GA, ID, IN, LA, MA, MD, MT, ND, NJ, NY, PA, RI, SC, SD, WI, WY. 28 Source: Region categorization based on U.S. Bureau of Economic Analysis, “BEA Regions”, www.bea. gov/regional/docs/regions.cfm. 29 A reported main or branch office location was counted as an office if it had a unique zip code and office name. If two offices had the same street address but different suite numbers they were considered a single office. A reported office location was not counted as an office if it closed before the end of CY 2016. 30 The FTE calculation is based on a 35-hour workweek and takes into account the percentage of a year an employee works. Volunteers are not included in the FTE calculation. Previously, volunteers were included in calculations of staff FTE in by the Numbers, but in this report volunteers are excluded.